Val's Quilting Studio : Mom, Will You Teach Me How To Knit? Look at his tail!!!! LOL!!! It's wagging so fast it's only a blur! Funny thing is I don't even knit. 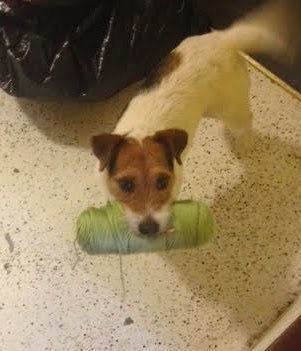 I had this yarn aside for my mom when all of sudden I turn around from vacuuming my studio and there he was with it in his mouth! (Note: it was up on a table) He seriously followed me around the house like this for 20 minutes! My husband and I just kept laughing. I geuss he really wants to learn to knit. Anyone think you can teach him? LOL! Look mama, I'm a good boy! Got this fuzzy toy down off the table all by myself! Maybe he thought it was a ball and you would toss it for him - too cute. Okay we totally didn't think of that! I bet you are right! He is such a toy/ball guy!! Now all you have to do, Val is give him some knitting pins. He is such a sweet fellow! What a cutie!! He found a toy! Oh boy! Oh boy! Oh boy! Oh boy! Oh, that is just so adorable!!! What a cutie-pie. Be sure he gets a good tummy rub for me. At least he didn't eat it! I think he's saying, Mom make me a green sweater vest! I can't teach him to knit but my fur babies can teach him how to shred it and string it all over the house. Our pets keep us laughing! Jackson is a clown and so cute Val! Jackson looks like he is a spit-fire with a devilish gleem in his eye! What a cutie! Too funny! Perhaps he thought you should stop vacuuming and pay attention to him! He really does look like he wants you to do something with that yarn, you can see it in those eyes. My grand-dog came out of my sewing room with a check in his mouth. Yikes! I was worried whether the bank would cash it "honest, my dog ate it"
Our Basset Ben was a devil for wool - even chewed up a few knitting needled attempting to pull the ball apart. thankfully present basset has no interest if its not do treat shaped! Hahaha - look at that tail MOVE!